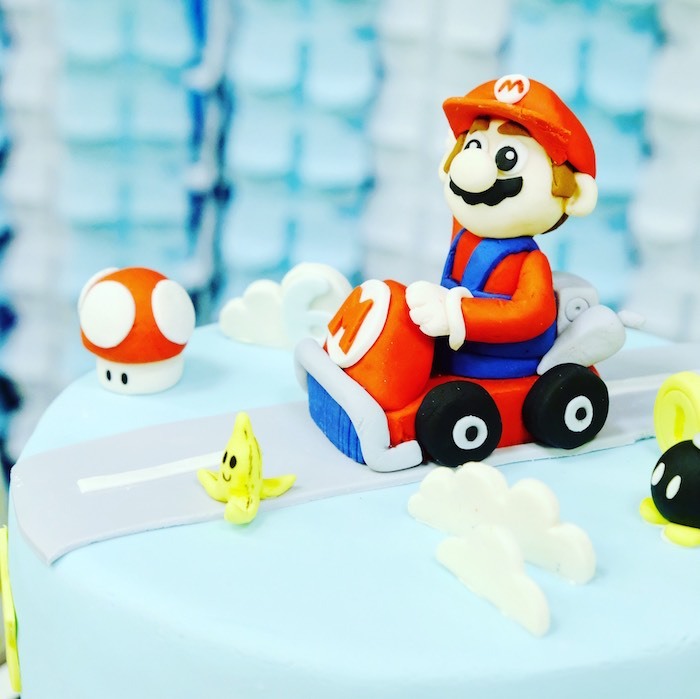 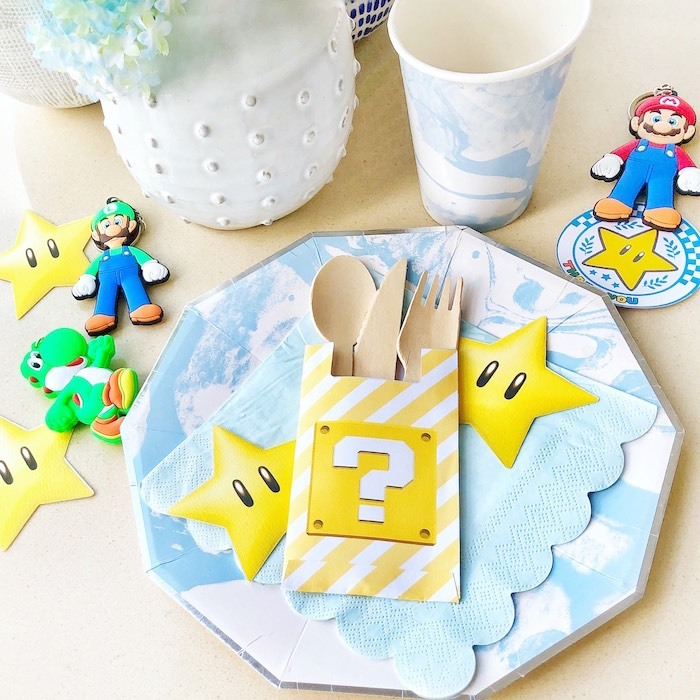 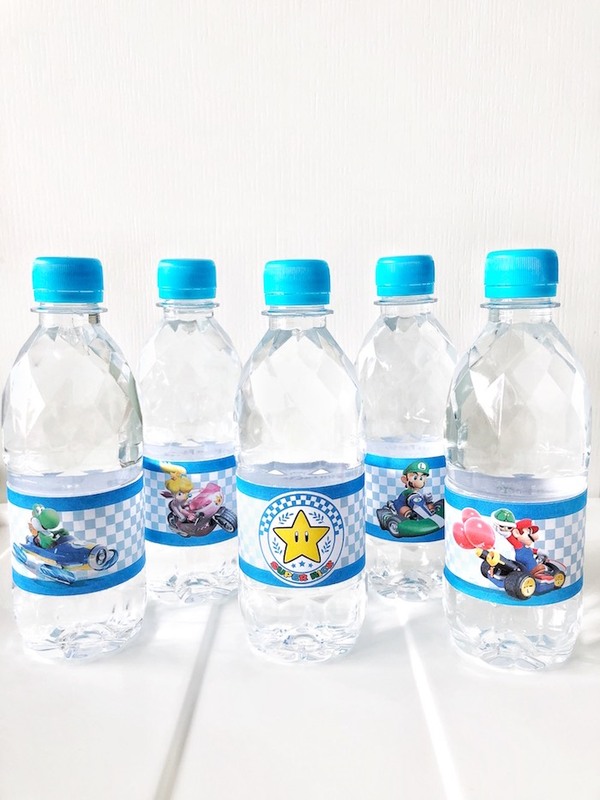 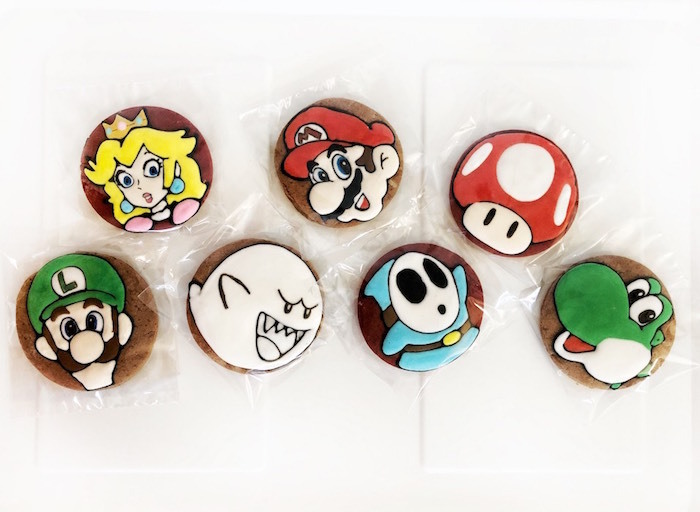 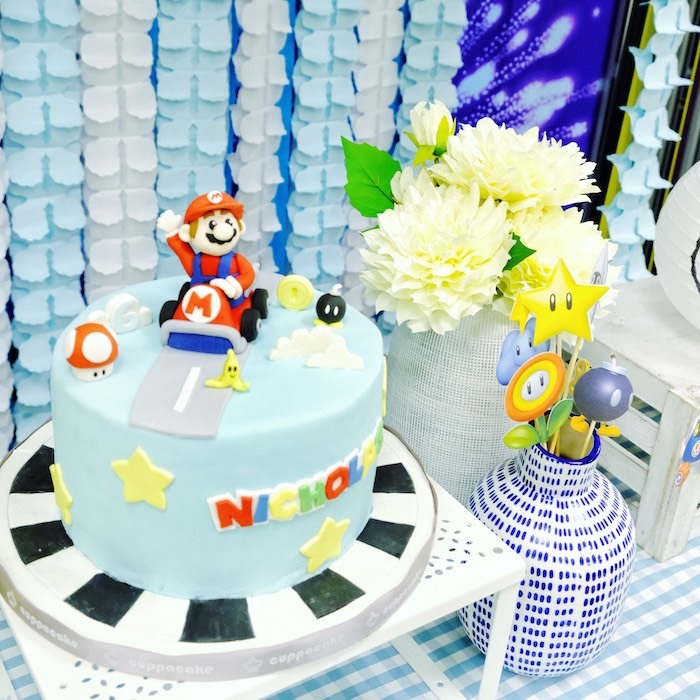 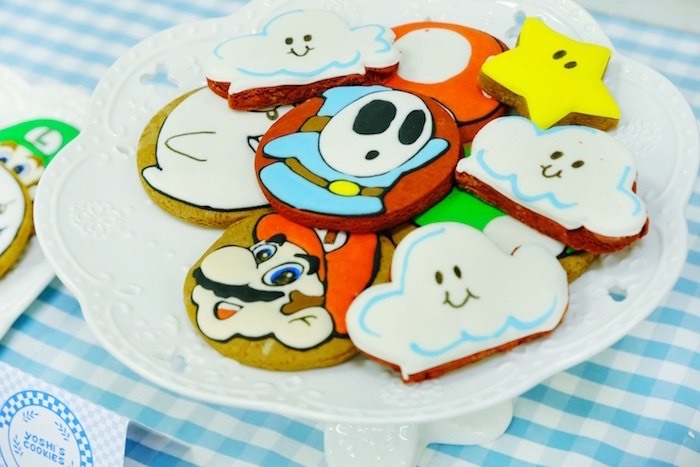 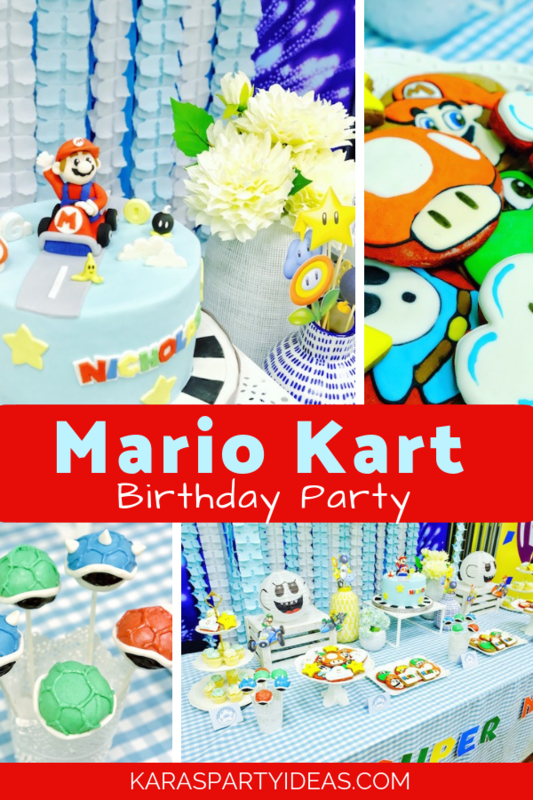 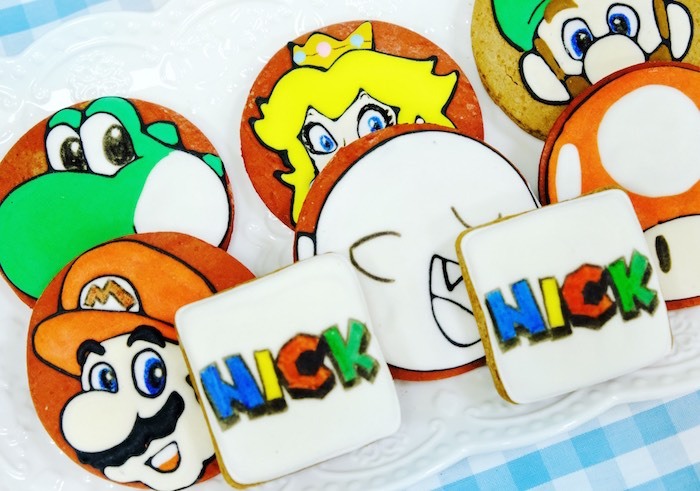 Pick your character and speed on in this Mario Kart Birthday Party by Nestology Studio , out of Hong Kong, China, is about to begin! 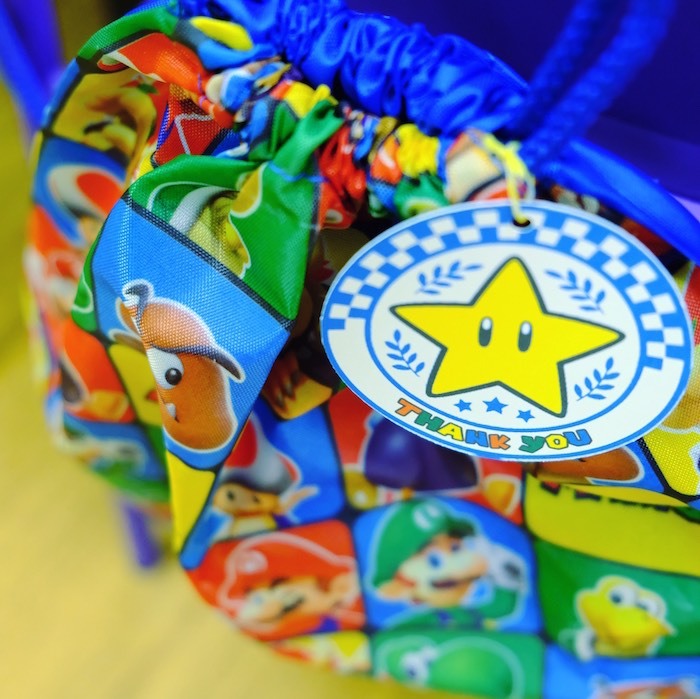 Filled with treasures and stars to get, this is a birthday celebration you soon won’t forget! 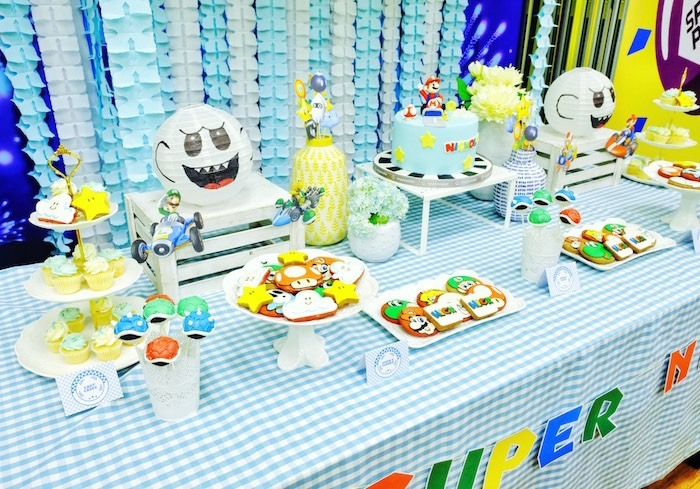 and Fun Character Cut Out Stick Centerpieces! 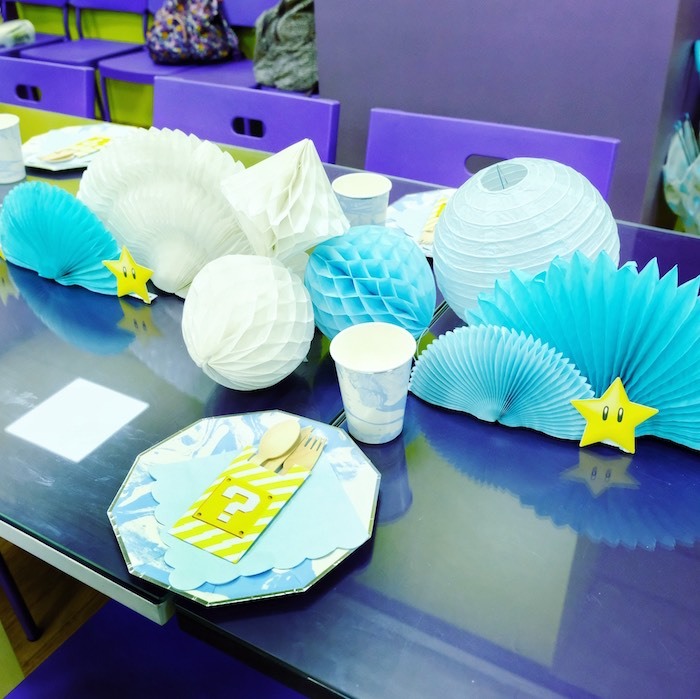 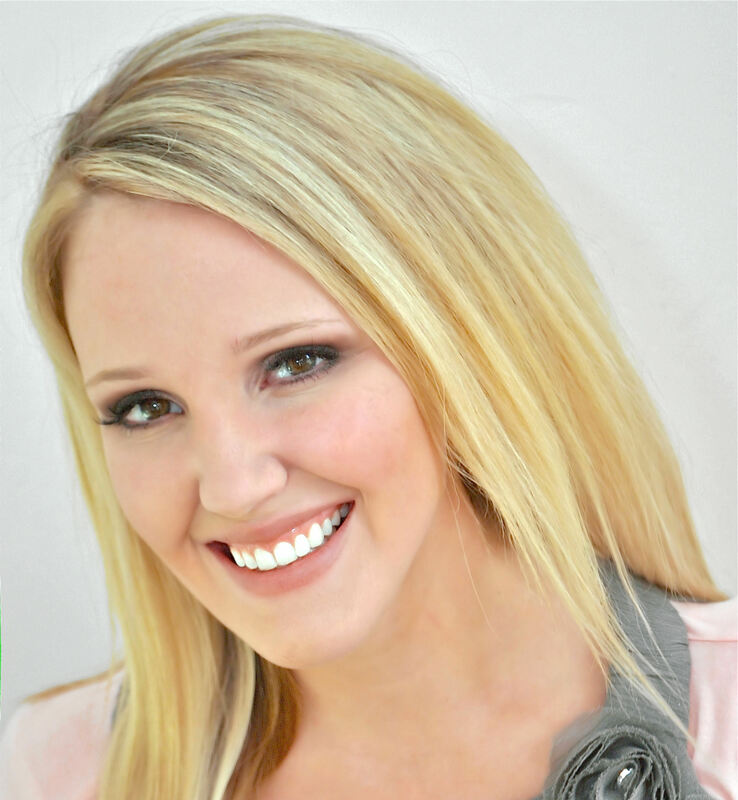 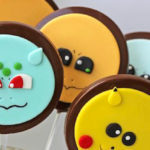 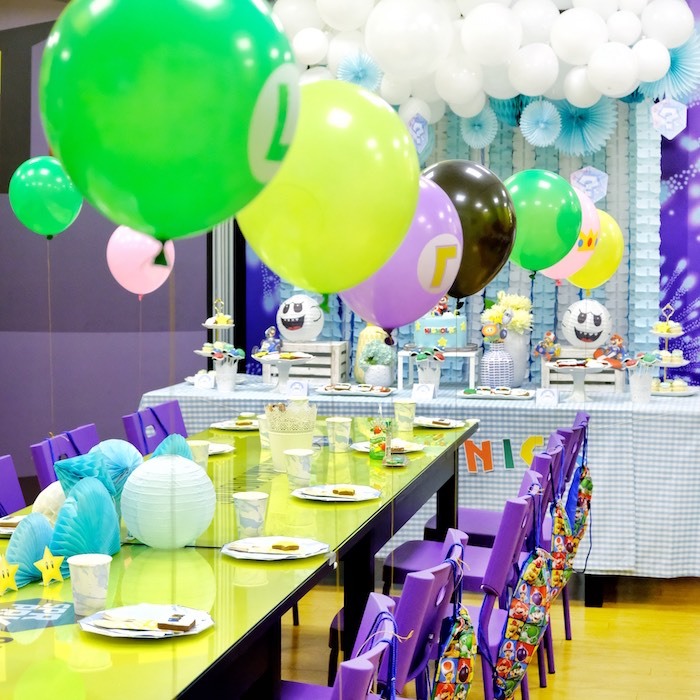 Nestology’s party description- “This party was so much fun to create! 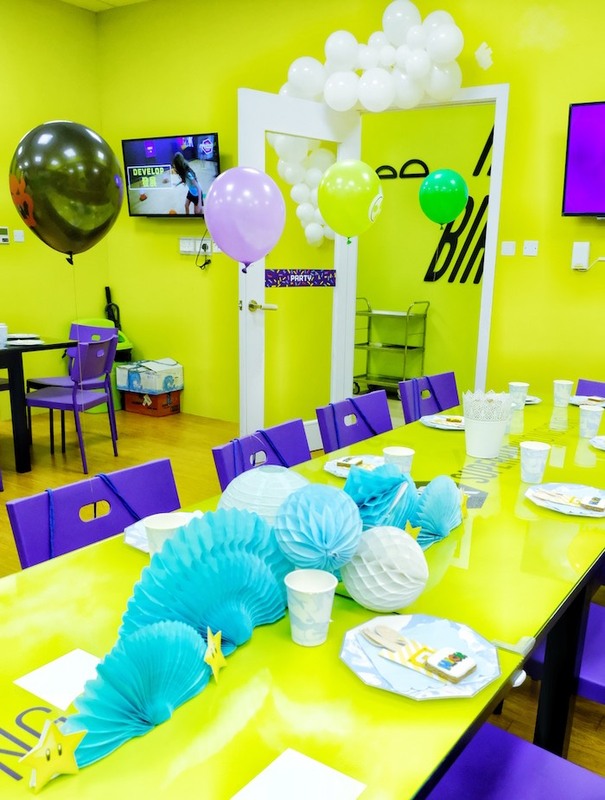 We put a modern twist to the theme while keeping it true to its look. 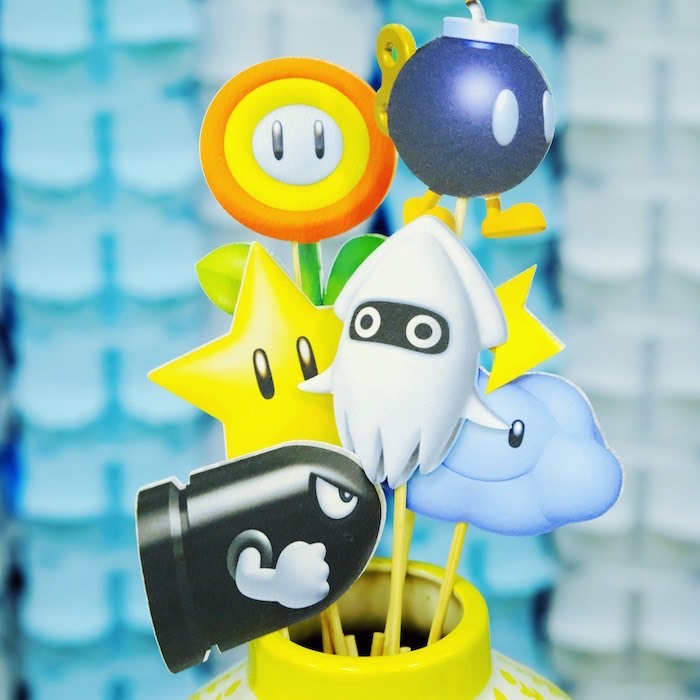 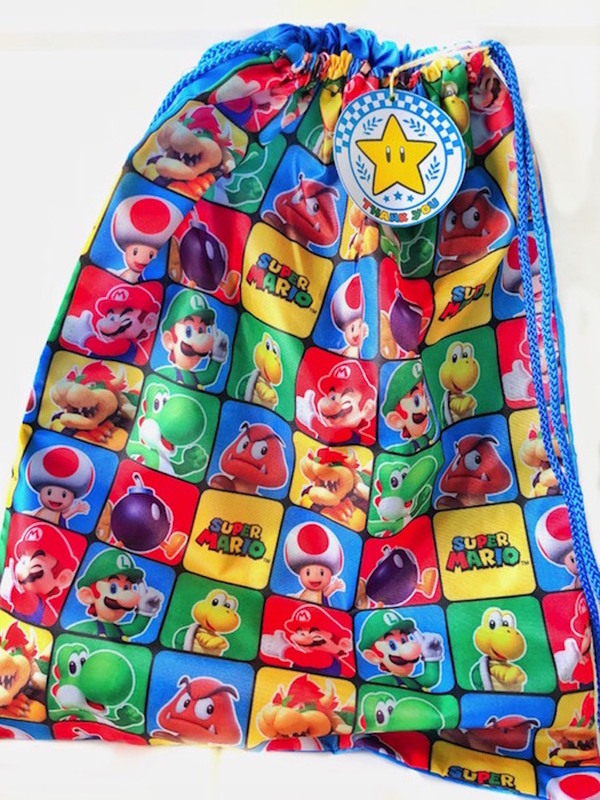 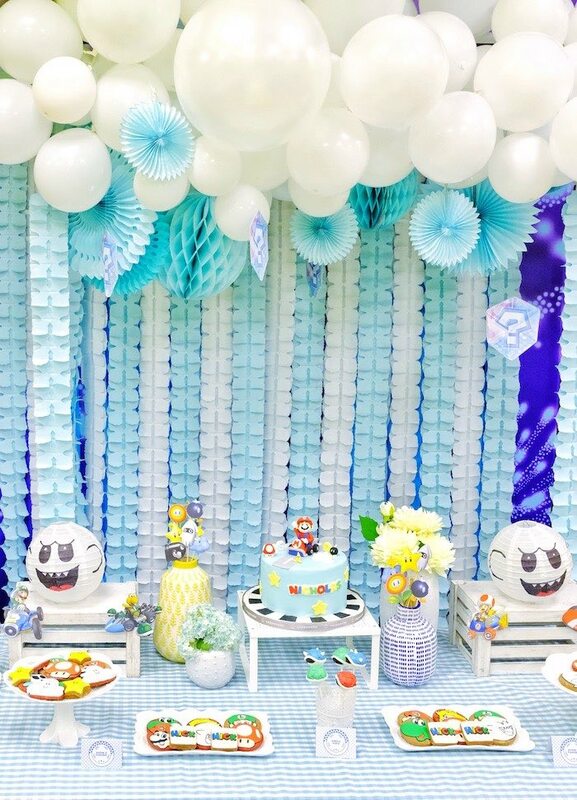 Mario Kart has a flurry of colors so we tried to pick white, light blue and yellow to anchor everything while still having those pops of rainbow colors it is so well known for. 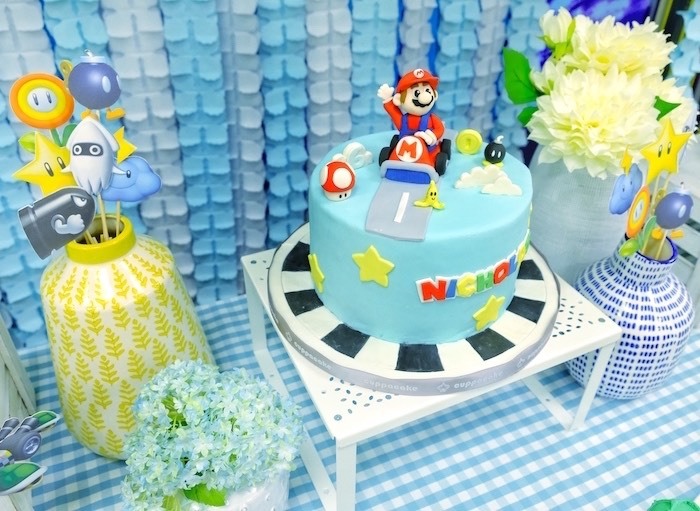 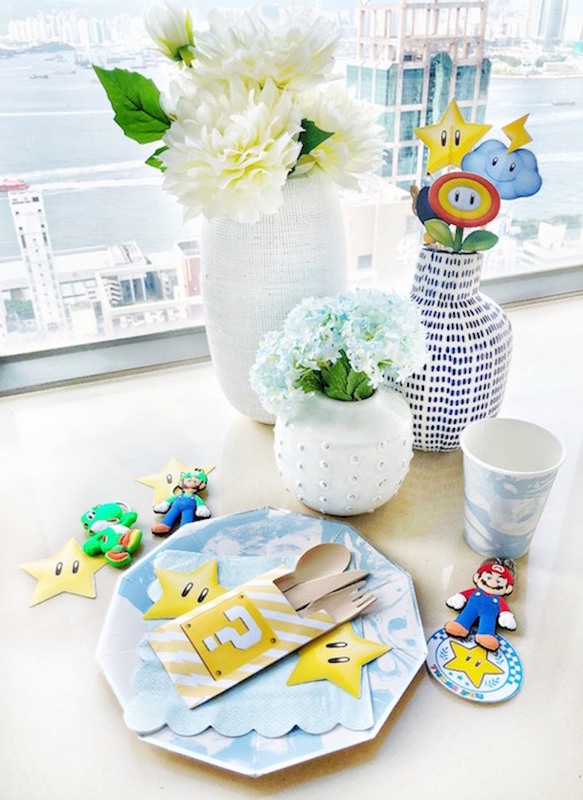 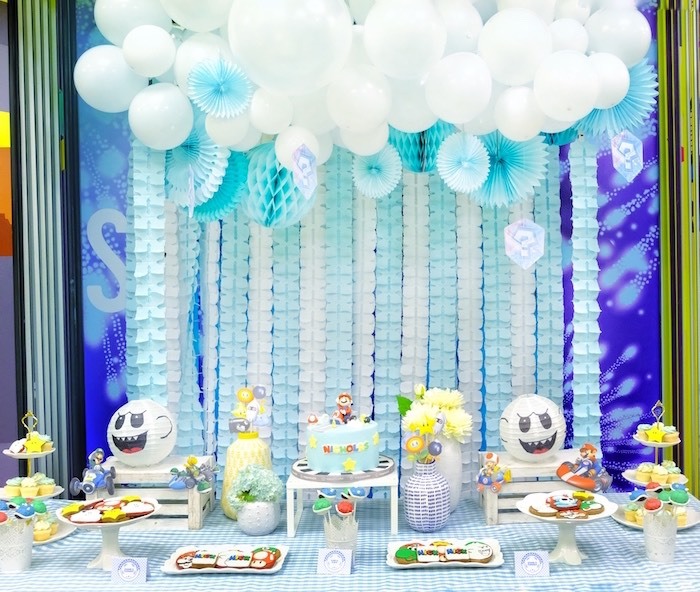 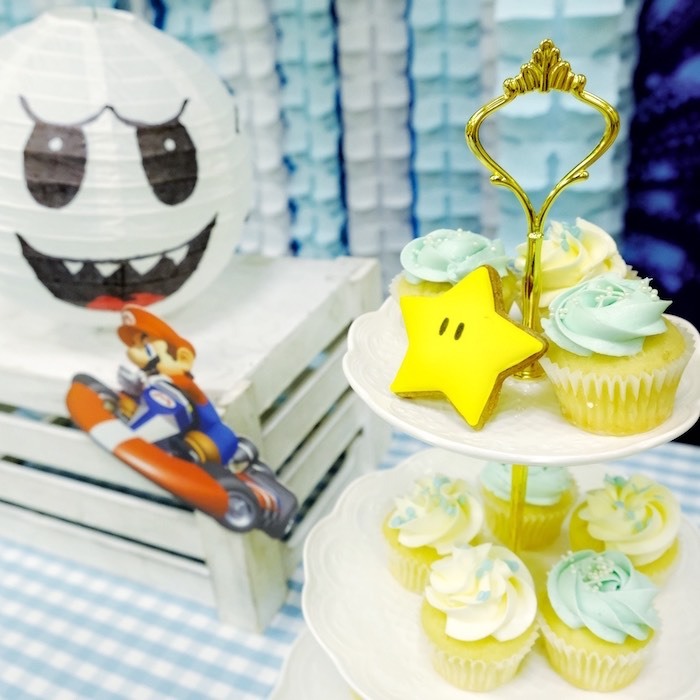 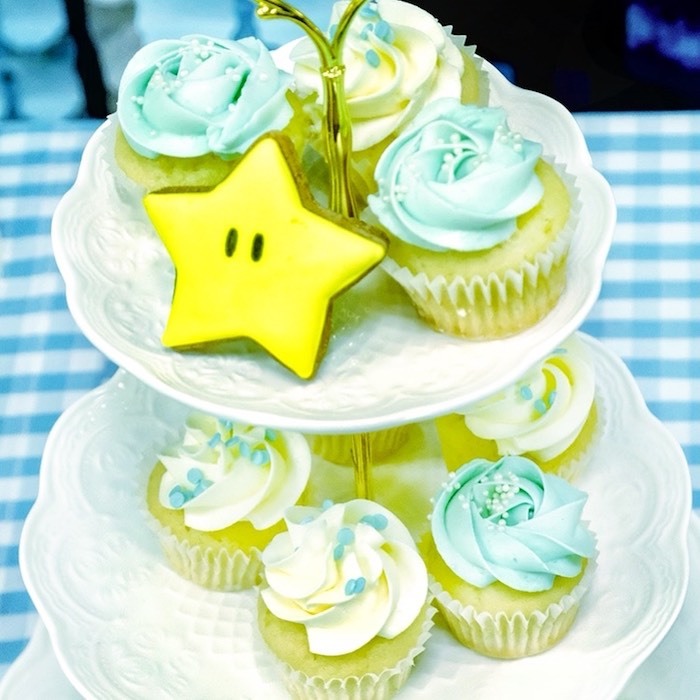 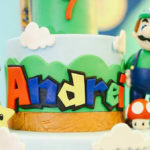 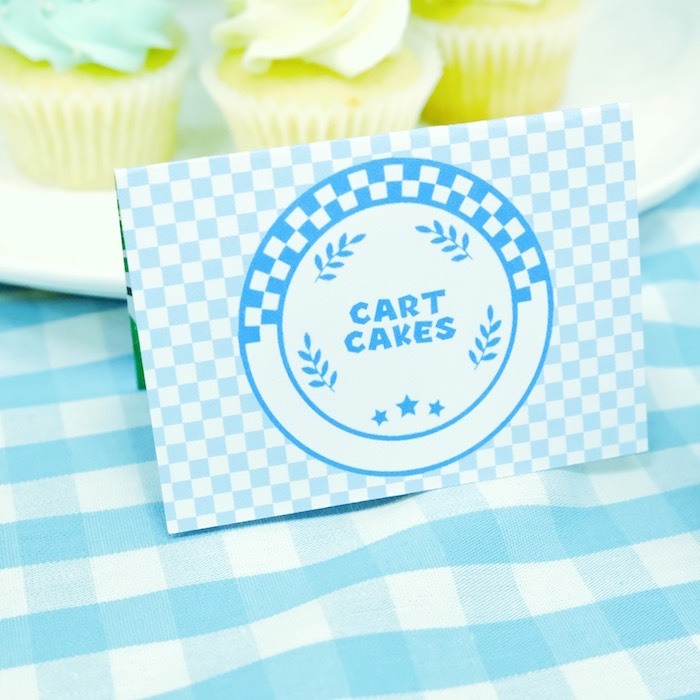 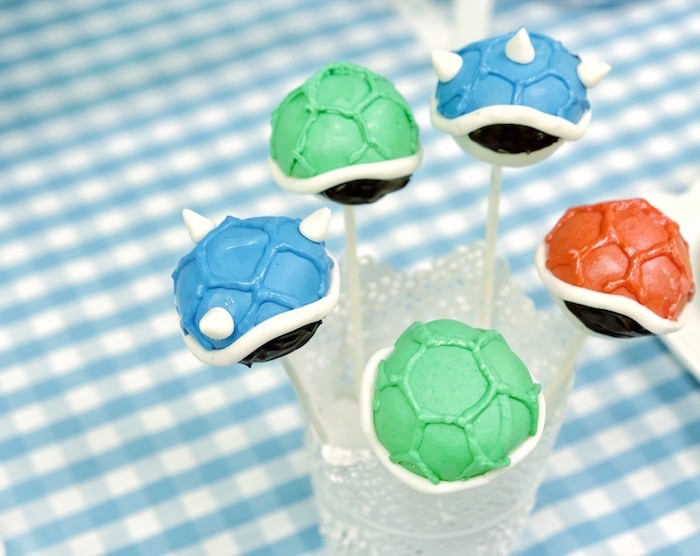 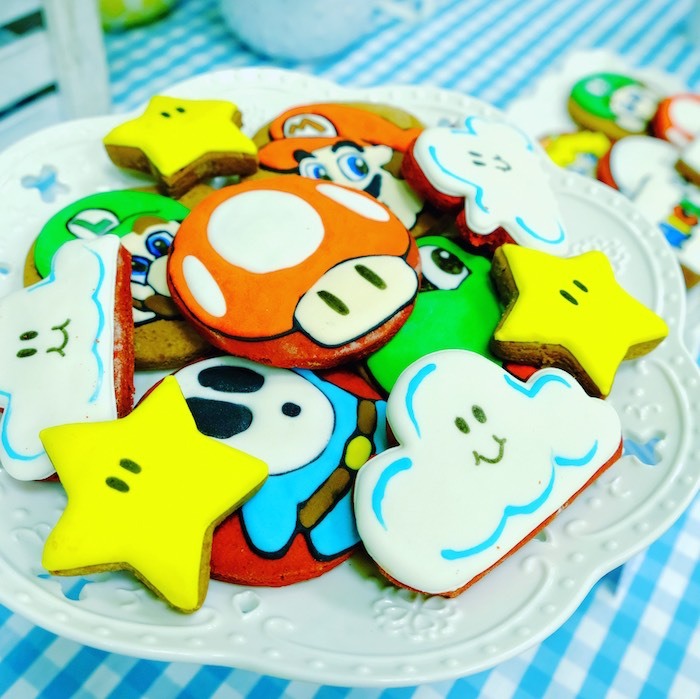 The dessert table had blue and white checks to act as a base for the best birthday cake, Koopa Shell Cake Pops, mini cupcakes, and custom character cookies. 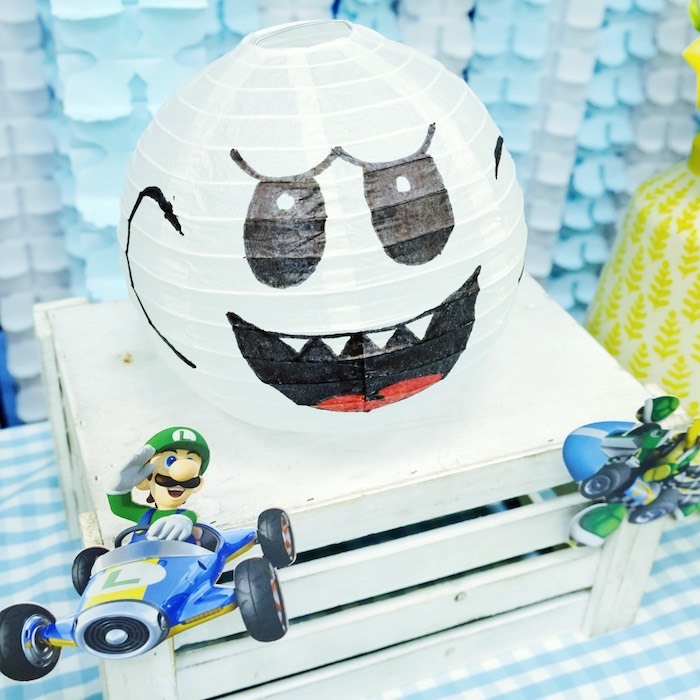 We put Ghost lanterns, character cutouts, florals, in theme vases, custom made labels and birthday bunting. 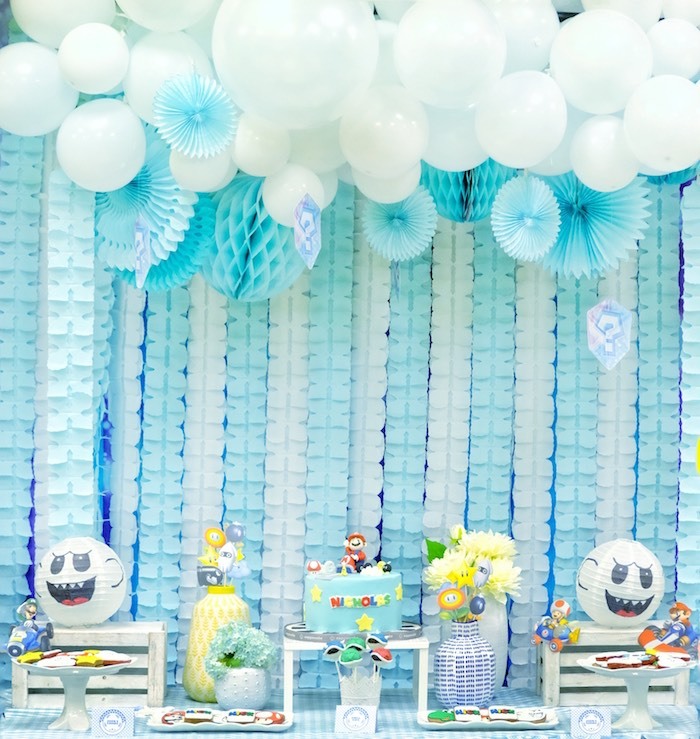 To act as a backdrop, we used light blue and white clover leaf streamers and above it, a special balloon x honeycomb x paper fan garland with floating question mark boxes.